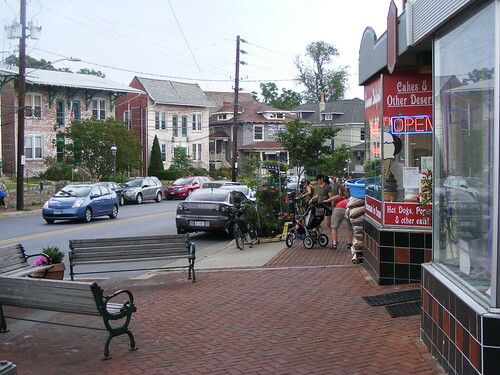 Takoma Park has long been known for their civic activism, dating back to the freeway fighters that stopped I-95 and I-270 from cutting through the area forty years ago. But that culture could prevent their community from allowing good changes to happen. One of the most unfortunate side effects of the urban activism of the ’60s and ’70s is the belief that development is wrong and that fighting it makes you an environmentalist. We know that dense cities are both environmentally better and dramatically more equitable places. Walkable neighborhoods are better than the suburbs for people with a wide range of incomes, and what happens in cities that don't grow is that they gentrify and poor people are pushed out. Trying to fight change makes you less sustainable and more unfair. Sometimes, standing in front of bulldozers is the right thing to do. It's likely that Takoma Park wouldn't have become a sought-after place to live if it were carved up by highways. And sometimes it's harmful, like the efforts of some residents to block a housing development adjacent to the Takoma Metro station back in 2007. Not all progress is bad. It's the mark of a true progressive when they can tell the difference. Right on target. The issue is not only providing housing for young people to stay in the county, but also providing housing suitable for retirees. As I get older, I recognize that the housing that could allow us to retire in the county probably doesn't exist. Single story, with destinations to walk to, but without the excessive distance from home/apartment to car common in mid-to-high rise apartments. We also want no part of the very small kitchens, dining spaces, and living rooms of a postwar house--or of the high maintenance of what will be, by then, a 70 year old house. Best answer I can come up with is to bulldoze or gut a post WWII Cape Cod or ranch house in an older neighborhood. Problem is that I can't ever see us having the resources to buy a house in Montgomery County to wreck it.